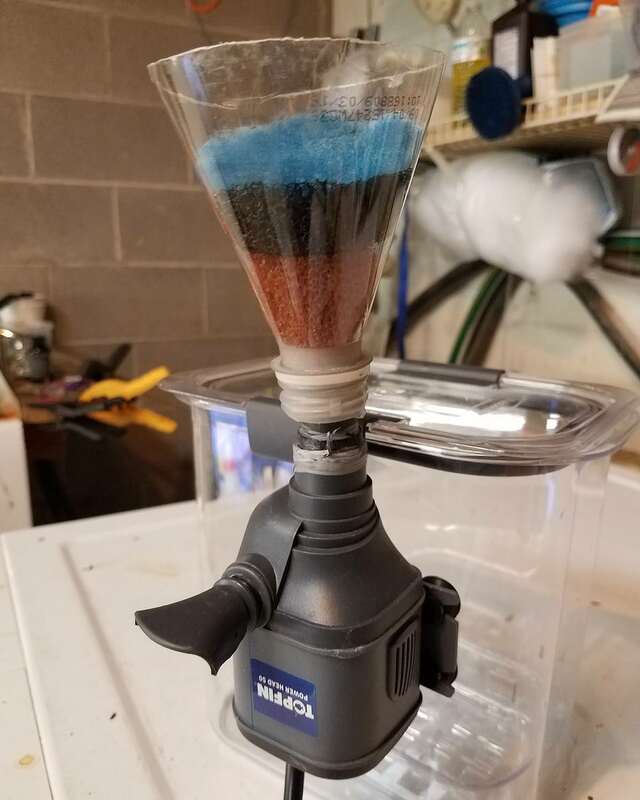 How to make a DIY skimmer for your aquariums. First, take your water bottle and cut off the top, keeping about 3-5” of bottle total, including neck. Take the silicone tape and run a few wraps around the intake of the powerhead, then feed the neck of the bottle over the intake and run a few more wraps of the tape around the bottle and intake securing the bottle to the powerhead.. A little play is ok, but tape so that the bottle stays in place over the intake. At this point, the bottle should look like it is upside down on the powerhead, with the open part of the bottle facing upwards. Now take your coarse foam, and cut a circle (or square, if the bottle is square) to fit snugly at the base of the bottle neck so that it impedes debris from being sucked into the powerhead. Then cut a similar piece of the filter pad to fit over the coarse foam pad. Sink your device into the tank and use the included suction cups to stick the device to the side of the tank. Gently push the bottle/powerhead down so that the top of the bottle, just breaks the surface of the water in the tank. Plug in your powerhead and the suction created to push the water will pull surface debris into the bottle, and be captured by the foam pads. If there is a large amount of plant matter or duckweed on the surface, you may need to clean the pads several times. To do this, first, gently lift the skimmer unit upwards so that the top of the bottle is above the water line. This will drain the bottle while the powerhead expels the water, and at that point you can pull the top pad and rinse off the duckweed under the tap. If you seem to have a lot of debris in the coarse pad, rinse that too…. Put them back and repeat, lowering the bottle again to just under the surface, until you have a majority of the topwater debris pulled into your skimmer. Once the majority is gone, you can leave the skimmer working for a longer period, (overnight if needed) until the final debris is pulled into the pads. With this DIY system, I can clean several tanks in hours, and rid them from that problematic Duckweed….. If you have a friend with Goldfish or Cichlids, you can always shake your pads in a bag and gift it to them. To save even more on this DIY project, keep an eye out for used powerheads or foam material in society auctions or tag sales. The silicone tape is a useful aquarium resource, and I use it for all kinds of projects, from wrapping tubes and fittings to sealing minor leaks..
GOOD LUCK AND GREAT DUCKWEED REMOVAL!